It’s been several months since the last usage update in June so I thought I’d post some updated numbers. Between January and October 2009, we had a roughly 13% and 16% monthly growth rate in page views and visits, respectively. 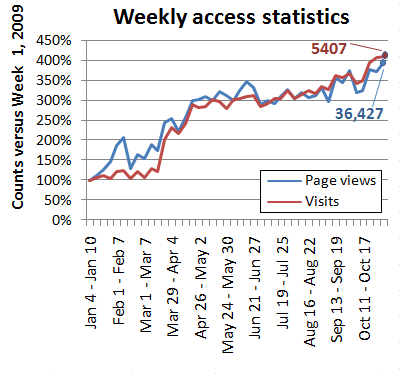 It’s pretty clear there was a steep climb in March and April when we started actively redirecting SymAtlas users to BioGPS. If you only look at growth after that transition (May – October), we see a monthly growth of 3% and 6% in page views and visits, respectively. Still some pretty healthy numbers I think. In October 2009, we had 21481 visits from 10586 unique visitors, resulting in 142,419 pageviews. There are currently 262 registered plugins in the plugin library, registered by 43 unique users. There are 2242 registered users of BioGPS, including 238 who joined in October. There are a total of 1174 custom gene report layouts created by 627 users.